At Aqua, our passion for food is rounded out by our lust for finding the perfect wine pairing. Our wine list boasts more than 80 vintages across a moderate price range. 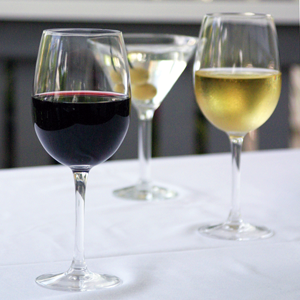 Our staff receives regular wine training and is always ready to help you pick out a perfect pairing for your meal. If you’re feeling playful, be sure to peruse our expansive martini list. We offer a variety of martinis, from the tropically sweet Blue Hawaiian to the spicy and savory Bloody Mary Martini. Menus are subject to change. Join us twice a month for WineOrama, when wine professionals introduce us to four new wines. Tastings are casual and can be enjoyed at the bar or over dinner. WineOrama wines are available for order and priced to sell. Check out upcoming dates at left. Our bartender chooses a favorite martini and we offer it for $5 all evening long. It’s Wine Lovers’ Night! All bottles are 33% off.